HOLLER IF YOU LOVE EGGS BENEDICT! Man, I love eggs benedict. I've eaten eggs benedict all over this fair country and it never gets old. However...the best eggs benedict I have ever had is at GIO Bistro and Wine Bar in Uptown La Mesa. Heres how the trip to Gio's this morning was planned saturday afternoon. Boyfriend: I talked to Eli and we're gonna have dinner tonight at Stone. Matt is coming down tonight and is staying over. Me: Okay, as long as you know we have plans tomorrow morning then that all sounds great. Me: That was your opporuntiy to ask me what those plans are. I haven't told you yet. Boyfriend: I already know. We're going to Gio's. Me: HOW'D YOU DO THAT??? You read my mind! We haven't been there in FOREVER! Boyfriend: Hahahaha because I know these things. Tomorow is Sunday and we havent been there in forever. They only serve this wonderful breakfast dish on saturday and sundays between 9 and 2 so you gatta plan your life accordingly. We do. Did I mention they have fabulous $1 mimosas? HOLLER! Okay okay now on to the recipe. This one is PERFECT for big brunches. First I'll do the muffin pan recipe then I'll give you the hollandaise sauce recipe. 1. Preheat oven at 375f. In a texas-sized 6 cup muffin pan (or using just 6 cups of a 12 cup pan) press half an english muffin, nooks and cranny side up, into the bottom of each cup. 3. 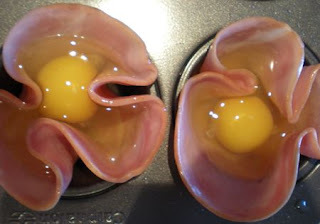 Crack one egg inside each cup. You may have to some finagling to do with the ham to make sure it stays in place on top of the english muffin. 4. Bake at 375f for about 12 minutes. Check it 10 to see if the whites are white. The yolk should be runny. 5. 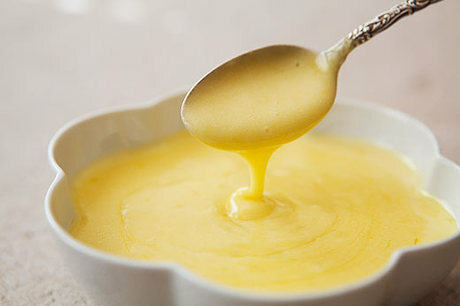 Read hollandaise sauce recipe. 1. Melt in a 1 quart heavy saucepan over moderate heat. Remove pan from heat and let stand for 3 minutes. Skim foam from top of butter. 2. Whisk together yolks, lemon juice, and water in another 1 quart heavy saucepan until frothy. Set pan over low heat and whisk constantly and vigorously until yolks are pale yellow and slightly thickened (you should be able to draw whisk through yolks and see bottom of pan before yolks flow back together), 3 to 4 minutes. 3. Remove pan from heat and gradually whisk in melted butter: drop by drop for first third of butter, then 1 teaspoon at a time for second third and 1 tablespoon at a time for final third, leaving milky solids in bottom of pan. Whisk in salt and white pepper. 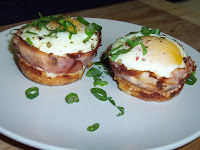 Enjoy your yummy eggs benedict cups with fresh hollandaise sauce!! I found lots of "Do you know the muffin pan sites". Looks great Amy!!! Very nice blog you have here -- I'll be back. Thanks for the comment and link to Nibbles of Tidbits too!!! Shut up, Shaun. haha If you bothered to look, they are product reviews not blogs. So there! ......all Im gonna say is THANKS FOR FREAKIN INVITING US !! I HATE YOU !!!!! Looks delicious Amy! Thanks for checking out Zoe Cuisine, I love the idea for your blog!